I have been following your articles through Kauilapele’s blog. Thank you for such incredible journalism. 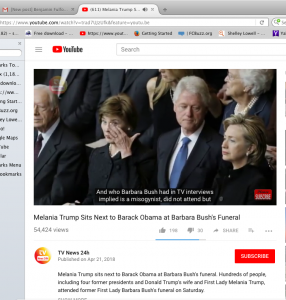 I took a few screen captures of images from ABC’s video of the Barbara Bush funeral video you referenced. 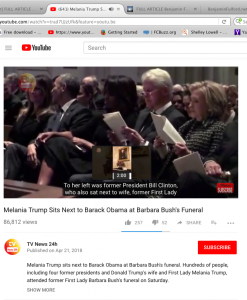 As you can easily see in the clip you referenced (which are all stills), the Clintons are seated with Barbara Bush to the right in the row behind them. 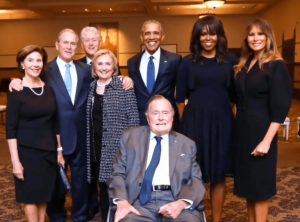 I believe it is Jimmy Carter seated two to the left of Bill. But according to the video, Carter didn’t attend the funeral. 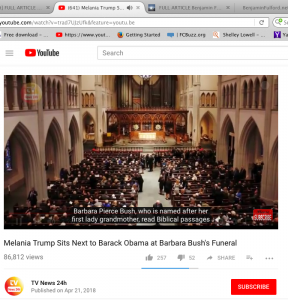 This clip is obviously from another event a while ago, since Barbara Bush, Carter, and the Clintons look younger, HRC is wearing a different jacket/outfit in this clip than in other scenes of her seated in the chapel as well as in the group photo of her with Barack and Michelle Obama, Melania Trump, the Clintons, and the Bush family. The tie Obama is wearing in the group photo is blue, while the color of this tie in the video is black or dark gray. Weird. 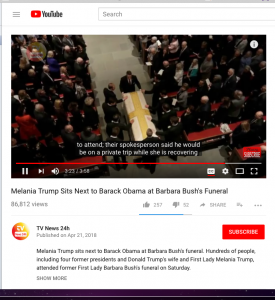 Below are other discrepancies with the casket…. In the overview shot of the chapel, there is no casket up front. Usually the casket would be there during the entire service. 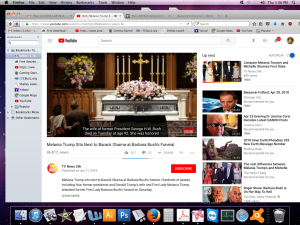 Also supposed to be Barbara Bush’s casket. It doesn’t match. Are Jews being falsely blamed? I have been receiving your newsletters from friends and associates for a few years now. I must admit I was amazed that you had the chance to interview David Rockefeller, a man who rarely if ever speaks with any person outside the world he lives in. Obviously you have something going on and many, as you know, were very suspicious when you got that talk, and felt that you are simply a plant and working for the Cabal and still do. The purpose of this communication is to tell you that although some of your information is excellent and bang on, some of it is so left-field I sort of scratch my head reading or listening to it. I am Jewish and orthodox 35 years, have lived in Israel, and have read the Torah (the actual script of God) 22 times from cover to cover. I am also heavily involved in the Jewish religious world and know all of it well. When you say that the Chabad religious community is trying to start World War3, I am just confounded. You do make a distinction later between the religious Jewish community and this other group, but I must tell you that, for example, this idea that each Jew will have 2,800 slaves at their disposal is 100% complete nonsense and nowhere in any place does scripture speak of this. There are some references to the Gentile people serving the Jewish nation after the final redemption, but this will be after the force of evil is permanently removed from the world. For the record, the Torah is the only text in humanity’s possession that has God speaking directly to humanity in the FIRST PERSON, providing a full disclosure of how the universe was created, what happened with the first man and woman and the aftermath, a complete history of what has transpired since, a complete moral and ethical code of what God expects from us, and of course much information about the end of history which we are now approaching. My concern is that there are millions of people who as you know are looking for someone to blame for all their misery. The information you are producing, some of which, as stated, is completely not true, is pouring gasoline on a fire, and of course who do you think will be blamed for all the misery that is approaching? Do not misunderstand me, I am not whitewashing the Jewish people and we both know that some of the worst people in history have been Jews, but I ask that you be very careful about this. The exact thing happened in Nazi Germany and 6 million were incinerated. I have met two grand master Masons in my life who admitted to me privately that the Jews are intentionally allowed to gain high-level positions just before the Establishment pulls the plug on a system they want to change. Sadly, it’s happening all over again now. The good news is that it’s going to end and God promises there will be divine intervention in a manner in which all nations will perceive God. After this, God will remove the power of evil and destroy it forever; there will be a resurrection of the dead and a final judgment. Everyone on earth will be judged. The Torah provides us with many signs as to how we would know the end of history is coming. All those signs exist today. Are you ready for the greatest show on Earth? First of all, I want to make it clear that I have Jewish ancestors on both my mother’s and father’s side of the family. I strongly believe I am fighting against the very same people who engineered the mass murder of Jews in World War 2. My religious belief is that we did not create ourselves but were created by something else, therefore there must be a Creator. The best way to respect the Creator is to respect the creation—in other words, to respect nature and other people. As a journalist, my job is to get information directly via my Creator-given senses from the actual creation itself. In other words, I rely on primary sources for my information and if it comes from secondary sources, I make that clear. As far as Chabad is concerned, I am sure there are many good and devout people associated with that organization. However, it is a fact, and I have recordings to prove it, that I was offered the job of finance minister of Japan and great wealth if I went along with a plan to kill 90% of humanity and enslave the rest. They said they would do this through disease and starvation, “because war did not kill enough people.” The person who made this offer was sent by former Japanese finance minister Heizo Takenaka. This person told me the offer came from “the Elders of Zion.” I have this on tape. Since that offer was made, the regime of George Bush Jr. actively manufactured and spread biological weapons like ebola, SARS, weaponized bird influenza, etc. This can be proven in a court of law. Furthermore, massive subsidies were issued during the Bush regime to induce farmers to grow “bio-ethanol” instead of food, resulting in food crises in 33 countries. This too is fact taken from the creation. On a final note, the satan-worshipping pseudo-Jew Benjamin Netanyahu has been recorded on March 12, 2011 as threatening to use weapons of mass destruction to kill the 40 million people living in the Kanto Plain of Japan unless Japan signed over the rights to all foreign currency the country possessed. Japanese military intelligence has the recording. 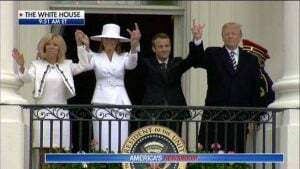 What I want to make clear is that the people behind this very real plot to create an artificial Armageddon are not Jews; they worship Set, Ba’al, Satan, etc. They pretend to be Christian (like the Bush family), Muslim (like the Saudi Royals), and Jews (like Netanyahu), but they are not. Our group is trying to remove them from all positions of power and expose the truth about these mass-murdering hypocrites to the world at large so they will never succeed in their fiendish plans. Someone should inform Fulford that that Sean Spicer video is a year old and he is no longer the White House press secretary! Thanks for pointing that out. Somebody emailed it to me and I should have double-checked the date. Nonetheless, the comment still applies to what the U.S. is actually doing in Syria to this day.